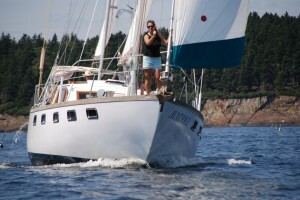 “I can’t thank you enough for a wonderful weekend of sailing lessons — it was worth every penny!!! You are a great teacher – very to the point, clear, and encouraging. 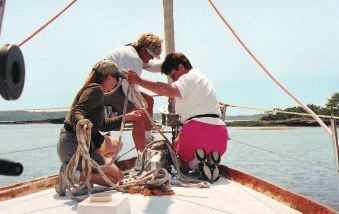 You gave equal attention to each of the students and made sure that we all experienced each aspect of sailing — your rotation technique worked beautifully. The hands-on approach is so important for me — demos are great, but only when followed up by actual experience. You provided that and more. 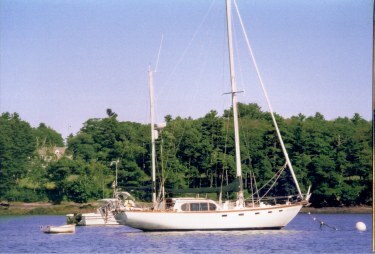 “A wee k after completing your sailing course in late June, my husband and I took off for a two-week cruise with the Portland Yacht Club. Somewhere along the way I lost you evaluation form, so I thought I would now, almost two months later, respond to your request for feedback. I enjoyed your “learning weekend” very much. The schedule of classes alternating with practice and relaxation time made for a nice and not-to-stressful experience. I thought that as a teacher you were clear and easy to understand, and I think we all felt comfortable asking you to repeat an explanation for the sixth time. I have crewed quite a bit in the past few years, but this was my first sailing instruction, and I feel that many gaps in my knowledge have been filled in. I felt more at ease on our recent [Portland Yacht Club] cruise and took over the entire job or plotting our course each day. I would like to learn more about GPS, radar and radio, but having the basics down was an important first step. 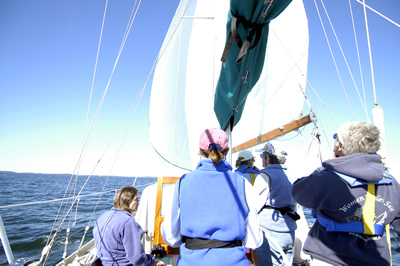 “I’m writing to express my satisfaction and admiration for your “Women Under Sail” programs. I am so pleased with the knowledge and confidence you gave me in three short days. Even though I’ve spent years on the water, many of the aspects were foreign to me. Your style, structure and content of teaching were excellent. 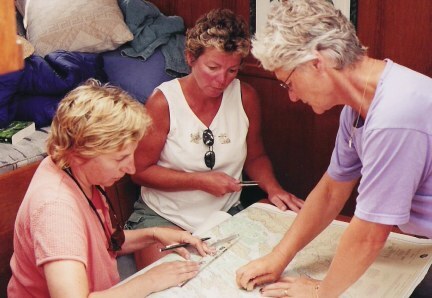 My partner, who is also a captain, is amazed at all that you taught us and thrilled with my new understanding of boating., Especially since he thought “it was going to be a bunch of hens, sailing around, having a grand old time”. It felt too cool when the course I plotted to Greenport LI agreed with his GPS!!! “Thank you for such a great experience aboard Avatrice! You are a fantastic teacher; very patient with us ‘rookies’. Your nurturing spirit really helped to put us at ease. jane is in my favorite spot on AVATRICE !! “I wanted to thank you for making an event in our lives possible. A couple of weeks ago my husband and I sailed to Castine with my cousin and his wife on the first leg of a 4 day cruise showing them the good spots in and around Penobscot Bay. On the walk to the restaurant that night my husband had experienced a funny sensation around his jaw and neck and told me that he had had a similar incident that morning as he walked to get our dinghy. When he had a third occurrence of the sensation upon our walk back from dinner we sought help and to make a long story short Mike now has a medicated stent in his Circumflex Artery. 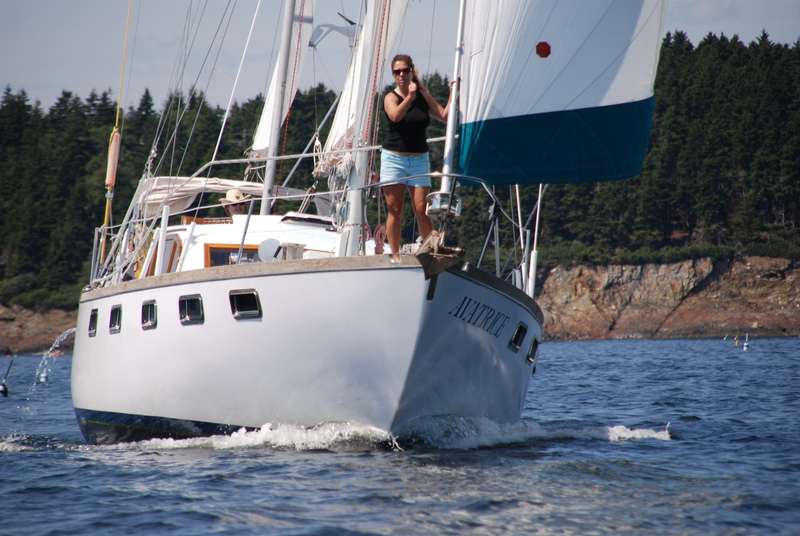 But why I am writing to thank you is that because of your class I had the confidence to take our boat back to a mooring in Bass Harbor with the help of my cousins. I was very nervous anticipating doing it and thought of having someone else take care of it but once I had all the courses charted I actually got excited at the prospect of being in charge. Of course if the weather had bad I’m sure I would have opted out. As it was it was a beautiful day and the trip was quite uneventful. My cousins wife who is not really a sailor but who is a good sport made lunch for us and my cousin JOhn who has excellent eye sight helped me with navigation. Luckily we could have done it with sight but what a great way for me to get to know our instruments, handling the boat, and running courses by doing it in the drivers seat not as a passenger.